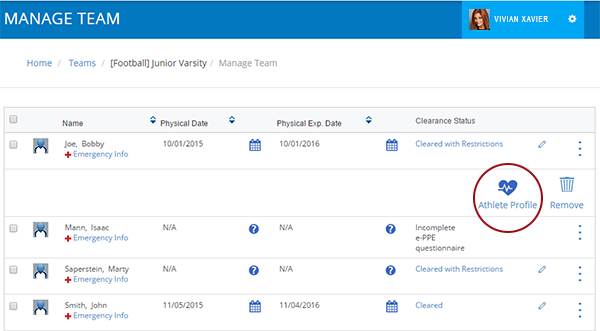 In this release we have made enhancements to how you access athlete information when viewing athletes individually or by teams. The navigation enhancement does not impact functionality, but reduces confusion when clicking into an athlete’s information. 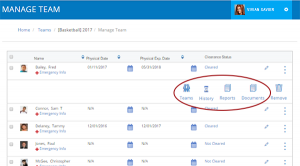 The navigation improvement consists of merging the Teams, History, Reports, and Documents icons into one new icon, called Athlete Profile. 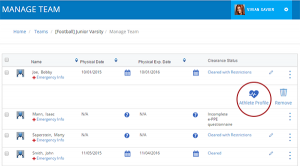 The Athlete Profile page allows you to review and manage all the information for one athlete, from one page. The functionality still remains based on your user role as set by the administrator for your organization’s PRIVIT Account. To get to an athlete’s Athlete Profile page, go to Manage Teams and either search for an individual athlete or click on members within a team and then click on the Athlete Profile icon or ellipse to get to the Athlete Profile icon for the athlete whose information you want to view. When the Additional Staff role is assigned to a user, this role will only be able to view selected documents for specific teams defined by the PRIVIT Admins.